Why don’t we pray regularly and with passion? Perhaps you do, but my experience as a pastor of many years is that most people do not. Prayer during a church service tends either to be monologues by the few, or thanksgiving one-liners by the several. As a rule, the official church prayer meetings are poorly attended and are usually rather sombre affairs. Private prayers are most often routine request lists concerning people, circumstances, and things. Pentecostal and charismatic churches often attempt to inject enthusiasm by praying very loudly and in tongues. Some people pace around while others lie prostrate. These are often just matters of style and tradition, and over time they result in as little real spiritual passion as the more conservative approaches. So why then is prayer usually such an uninspiring activity? I can suggest three reasons. Firstly, we tend to forget that prayer is simply communicating, directly and immediately, with God; not with a God far distant, but with the God who is with us. If my understanding is that God is far away in heaven, and that although he eventually receives my prayers he doesn’t always respond, then I probably won’t be too excited about the prospect of praying. The whole process will seem like a long-distance letter from a third cousin (me) to a very busy head of state (God). The letter goes off but nothing comes back, and so I write another letter, and then another. Eventually, I write occasionally only because my ‘sister-in-law’ testified that she actually got a letter back once (and it contained a nice cheque!). If, on the other hand, I understand prayer as a dynamic conversation with God, who is with me, then I will be keen to pray, and to listen. Perhaps we inherited this misconception of prayer from the Old Testament worldview. 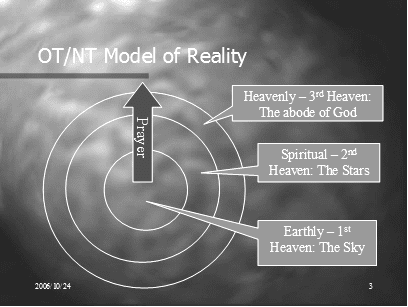 In terms of this model, prayers and God’s responses are part of spiritual warfare. Sometimes there are long periods before the prayer receives any response, during which time there is no indication that God has heard the prayers in the first place. This long-distance, time-delay concept of prayer is neither dynamic nor engaging. The second reason our prayers often tend to be passionless is that so many of us Christians are rich, healthy, and self-sufficient. Why do I need to pray earnestly if I have everything? I wonder how the Lord likes it when his people think of him as a magic genie? Surely, prayer is not about getting things, but rather about communicating with God our Father. If we realised our real need, then we would be far more passionate than we are about prayer. Our real need is not health or wealth, but relationship. God created us to be in a relationship with him, and relationships need communication to develop and mature. Imagine a relationship with your spouse or parent that did not involve any form of regular and meaningful communication. Of course, such relationships do exist, but they are unnatural and inevitably end in estrangement! The third major reason for passionless prayer is that deep down we are not convinced it ‘works’. We have become confused. We have bought into the false teaching that prayer itself has power, yet we see so few results of our prayers that we have become silently cynical. We talk about the ‘power of prayer’, and we applaud when others testify to answered prayer, but in our hearts, we just do not believe in it any more. Here are quotes by three of history’s great men of God: I mean no disrespect for them, however I believe that some of their teachings concerning prayer miss the mark. Much current teaching on the subject of prayer particularly troubles me. Andrew Murray was a wonderful ‘prayer warrior’, but did he mean by “God rules the world by the prayers of his servants” that God acts by using the prayers of his people, or that he rules in accordance with the expressed will of his people? Did E.M.Bounds believe this? Did John Wesley? I suspect that they included what I call ‘proclamation’ in their definition of prayer. Even if this is so, their statements seem to indicate that God requires ‘prayer’ before he can act. 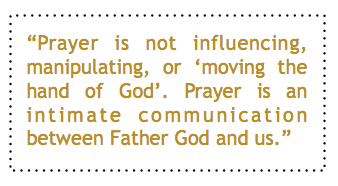 In his book on prayer, Miles Munro spells out this concept in unmistakable terms. He holds that because God has given man sovereignty on earth, he cannot do anything unless we give him permission (that is, prayer). Dutch Sheets has developed a similar concept in his book on prayer subtitled How God can use your prayers to move heaven and earth. To illustrate my point further, here are two quotes from a book called Unleashing the Power of Prayer, which contains 30 addresses to The International Prayer Assembly for World Evangelism which met in Seoul in 1984. In contrast to this, here is what Paul E. Billheimer writes in Destined for the Throne; “There is no intrinsic power in prayer as such. On the contrary, prayer is an acknowledgement of need, of helplessness. If He chose, He could act arbitrarily without regard to prayer or lack of it. All power originates in God and belongs to Him alone. He ordained prayer not primarily as a means of getting things done for Himself, but as a part of the apprenticeship programme for training the church.” That expresses where I stand. Prayer is not transacting spiritual business over God’s shoulder. Prayer is talking with God. More than that, it is communing with God. I use the word ‘privilege’ in the heading to this section because prayer is exactly that, a privilege. As sons and daughters of the Father, we have the wonderful benefit of approaching almighty God in prayer. Prayer is not transacting business in the spiritual realm. Prayer is not influencing, manipulating, or ‘moving the hand of God’. Prayer is an intimate and immediate communication between Father God and us.